“After the parliamentary elections Lithuania and Poland can look at their bilateral relationships”- thinks Minister of Foreign Affairs of Lithuania Linas Linkevičius.The leader of Lithuanian diplomacy was talking about that in Brussels with Witold Waszczykowski, the Minister of Foreign Affairs of Poland. The head of Polish Ministry of Foreign Affairs said however, that “all keys to make the relationship between Polish and Lithuania better are situated in Vilnius”. Linkevičius and Waszczykowski are taking part in the meeting of leaders of foreign departments of NATO countries. 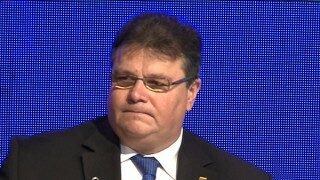 As Linas Linkevičius informed, mutual discussions were concerning mainly the issue of safety. “We agreed that we will keep intensive contact, I invited Witold Waszczykowski to Vilnius once again- we will see how will he manage to plan his time. Considering the fact that our new government starts working, there is a will to look at those relations once again and to use all the possibilities”- said the leader of Lithuanian diplomacy. According to Linas Linkevičius Poland’s and Lithuania’s businesses if it comes to the relation with Russia and placement of NATO forces in our countries’ territories are convergent. “There are various initiatives connected to the reinforcement securing, dialogue with Russia. We are negotiating our statements, they are pretty much the same. We do not want to damage already fixed in Europe construction of safety”- he emphasized. The Minister of foreign affairs in Lithuania admitted however that national minorities’ problems are a putting shade on Polish- Lithuanian relations. They are the reason of abandonment reciprocal visits- representatives of Lithuania and Poland are meeting only during international gatherings. The leader of Polish Ministry of Foreign Affairs Witold Waszczykowski assessed that his conversation with the Lithuanian acquaintance did not have a “binding character”, but survey one so he cannot talk about any details. For now Poland is waiting for the formal pledge of the new Lithuania’s government. “We hope that the new government will begin to implement decisions that were made, standards and norms that are parts of European community goods”- said Waszczykowski asked about expectations of Warsaw towards Vilnius. Being asked even more questions, he added that it depends, for instance on the rights of Polish minority in Lithuania. “All keys to make the relationship between Polish and Lithuania better are situated in Vilnius”- he emphasised. The cooperation of NATO with the European Union was one of the main topics during the first day of meeting of NATO diplomacy leaders. Ministers approved a package of documents that implement the Mutual Declaration of NATTO and the European Union that was accepted during the Summit in Warsaw. The leader of Polish diplomacy emphasised that NATO and the European Union should join their forces in order to not compete and not to double each other. Ministers discussed also the current status of relations with Russia. Minister Waszczykowski during the press conference reminded that during the NATO summit in Warsaw a strategy of strengthening the eastern flank but also of open policy and dialogue with Russia emerged. “We accepted the return to discussions NATO-Russia related but in fact for now it is not much effective. Russia sometimes uses those meeting in order to promote its own policy, however we cannot see any will of cooperation”- emphasised Minister Waszczykowski and also added that Russia as a country that is not a member of NATO does not have any power to decide along with the Alliance about its actions. On Wednesday ministers will talk through the Alliance cooperation with Ukraine. Leaders of diplomacy will also run consultations with countries that are not NATO members and are part of alliance mission Resolute Support in Afghanistan.